Director Clint Eastwood says that "J.Edgar," his new film about the man who founded the FBI and ruled through eight presidents with an unwavering iron fist, is "a love story," not a political profile. 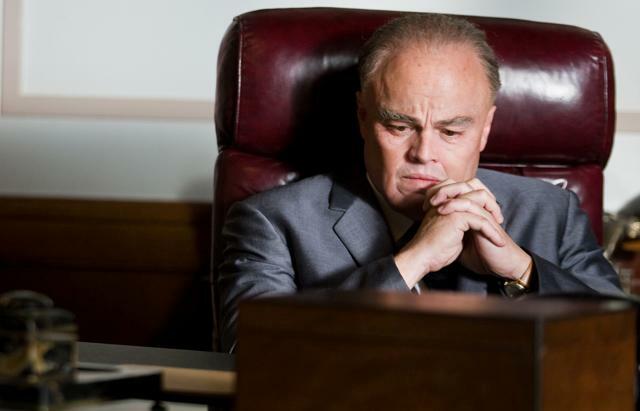 The film explores J. Edgar Hoover's emotional attachments to the tiny inner circle of people he trusted. "For me it was about trying to capture the man and come as close to him," Eastwood said in an interview with "Nightline's" Terry Moran. "An accurate portrayal of his intentions, his mannerisms, his ambition, what drove him, and what he was like on a day-to-day basis." Eastwood's biopic, which debuted at the Carmel Film Festival last month and will be in theaters on Nov. 9, paints a portrait of Hoover from the great "Red Summer" of 1919 to the Civil Rights Movement of the 1960s, both as the controversial "bull dog" tyrant who would do anything to protect his country and as someone who shared an "unrequited love" with his right-hand man at the Bureau, Clyde Tolson. "It's a love story between two men, in a way," Eastwood said. "But I didn't want to make it -- I didn't want to diminish it by making it just some sort of sexual attraction or something like that. It had to be much more substance to it than that." Although it was never publicly confirmed, Hoover, played by Leonardo DiCaprio, was long rumored to be in a secret relationship with Tolson. Often the two men were seen driving to work together, vacationing together, eating meals together and they were buried close to one another. Hoover even left his estate to Tolson after he died. "I don't think anyone truly will know the absolute truth about J.Edgar Hoover's personal life," DiCaprio told Moran. "I think that, sort of, passed away with him and Clyde Tolson." He added, "I think the way Clint handled it in this movie was very tastefully done because what it did reflect was people who had unrequited yearning to have that sort of connection with somebody else." DiCaprio and Eastwood said the film's screenwriter, Dustin Lance Black, drew on the Bush administration's response to the 9/11 terrorist attacks to develop Hoover's character during the Red Scare. Eastwood, 81, grew up during Hoover's reign and says he has real memories of him as a larger-than-life figure. "Everybody thought he was the 'Top Cop,' he was actually referred to as that," Eastwood said. "America's 'Top Cop' as in the Federal Bureau of Investigation." But Eastwood said it was DiCaprio's enthusiasm for the role and attention to detail that won the 36-year-old the part of a 77-year-old man. DiCaprio, who already has Oscar buzz swirling around him for his portrayal of the FBI director, said he took the role because he thought Hoover was a "fascinating character." "To me, [Hoover] has always been somebody who always had so many salacious rumors around him, a lot of lies too," DiCaprio said. "The whole thing about him dressing up as a woman and going out to parties with a tutu on was just ridiculous. He spent his life investigating other people's secrets but protecting his own. There's no way in the world he would have gone out in public like that, no matter what his sexual preference was." Transforming DiCaprio into an aging Hoover took much more than just an extensive make-up process. Aside from learning to move more slowly, the actor studied the FBI director almost compulsively. DiCaprio said he traveled to Washington, D.C., where Hoover was born and lived with his mother until he was 40 years old, and visited the bedroom he died in. DiCaprio also walked the halls of the FBI building and sat in Hoover's chair, trying to get a feel for what it was like to be "The Boss." DiCaprio and Eastwood also interviewed former FBI agents who worked under Hoover to find out how the FBI director would speak to people, how he would gesture -- even if he liked donuts -- to further develop his character for the film. Former FBI agent Deek Delosh was one of the last agents to know Hoover well. According to DiCaprio, Delosh described Hoover as a man who became more sensitive and emotional as he got older. "[Hoover] felt things fragmenting around him," DiCaprio said. "He felt his, sort of, power diminishing and his influence diminishing and he would oftentimes have bouts of depression where he would be sobbing." But one of the more challenging scenes, DiCaprio said, was when he, portraying an older Hoover, had to sit across from Jeffery Donovan, who plays a young Robert Kennedy in the film. "[Hoover] speaks to him like he's a young whippersnapper wet behind the ears and doesn't know the first thing about politics," DiCaprio said. "So to have not only the weight and all the prosthetics, but to have that sort of command at 50 years of experience under your belt and you know, knowing this country on a more intricate level than this young political upstart could ever imagine, was a challenging one." DiCaprio recieved an Oscar nomination for his portrayal of Howard Hughes in the 2004 film, "The Aviator," but is still more recoginzed today for playing Jack Dawson in the 1997 blockbuster "Titanic," a role he said he was "very proud" of. He added that it is not the characters that draw him into doing a film, but the story. "To do a movie just for the sake of doing a romantic comedy or doing a science fiction film seems sort of a profound waste of time," DiCaprio said. "You read something and if you're moved by it and you feel like you know it can be a perfect film and you can do a good job in it and that's sort of my philosophy."